Many of you have heard that May was a month of hospital visits for blood clots. I am fully recovering and on new medication that has me feeling better than I've than I've felt in years. I appreciate all of your thoughts and prayers. During this period, I realized that I had come through a 3-4 month cycle of unexplained difficulty. It was like living in two worlds, wondering which was real as both felt very real. On one hand, there was a clarity of mind and on the other was a clarity of pain. The combination made me wonder what was going on. Recently, I was reminded that vultures had been hovering over my home for the last 3-4 months. I always enjoy vultures, so I felt blessed to see them each day. Never occurred to me that they were informing me that I was in a cycle of death and rebirth, a time of deep purification, and the arrival of a new vision. The death and rebirth fit my sense of two worlds existing simultaneously. The purification fit the crisis around the blood clots as there was not much flow and therefore life with me. Interestingly, I've felt for months that something was changing in my being or way of being. More ceremony in workshops, deeper journeys, something new. I thank Jan Stefanchek for sharing her observations about the vultures hovering over me. I feel a renewed sense of understanding of the last several months with a sincere appreciation for what is to come. The September Crystal Workshop has a couple of spots, as does the December 6 Chambered Heart. The October Hawk Medicine is full with a waiting list. In 2014, I am going to do 4 workshops at Camp Asbury in Hiram, Ohio--- February, May, September, & December. I also will continue to do 2 workshops at Bethel Horizons in Dodgeville Wisconsin. Dates will be finalized once we know. Look for one of the workshops being vulture medicine. Keynote: Purification, Death & Rebirth, New Vision Cycle of Power: Year-round, Summer and Winter. The Turkey Vulture received its common name from the resemblance of the adult's bald red head and its dark plumage to that of the male Wild Turkey, while the name "vulture" is derived from the Latin word vulturus, meaning "tearer", and is a reference to its feeding habits. The word buzzard is used by North Americans to refer to this bird, yet in the Old World this word refers to members of the genus Buteo. The generic term Cathartes means "purifier" and is the atinized form from the Greek kathartes. The species name, aura, is Latinized from the Native Mexican word for the bird, auroura. The Turkey Vulture was first formally described by Linnaeus as Vultur aura in his Systema Naturae in 1758, and characterised as V. fuscogriseus, remigibus nigris, rostro albo ("brown-gray vulture, with black wings and a white beak"). The vulture is the most misunderstood and misaligned bird. People see them as gross and associate them with death, but myths reflects just the opposite. In Greek tradition, it was associated with heaven and earth, spirit and matter, good and evil, guardian and avenger. It was considered the avenger of the nature spirits. To the Assyrians, it was a link to a guardian of the mysteries of life and death and the road of salvation. In Egypt, the goddess of truth is usually depicted carrying a vulture feather. It was also a mother symbol enabling other life to sustain itself. To the Pueblo Indians, it was a symbol of purification. Its medicine would restore harmony that had been broken. Its feathers were used in rituals for grounding after shapeshifting ceremonies, facilitating the return to the self. It was used to dispel evil, to break contact with the dead—exorcism (as in channeling, shapeshifting or other forms of mediumship), to dis-charm objects and even to recover slain warriors (soul retrieval). 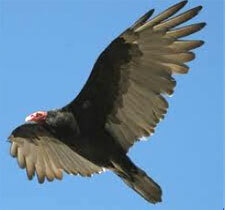 In old beliefs, when turkey vulture comes back after winter, there will be no more frost. Also wearing a feather of a black buzzard was thought to prevent rheumatism. They have also been associated wrongly with greed and heartlessness. The vulture is a member of the raptor family (hawks, owls), but unlike other raptors, its weak feet and short talons make it unsuited for tearing and grasping. It relies on others to do the killing. Although its role as a scavenger is often considered disgusting, it serves an extremely valuable and necessary function. It limits infections and bacteria for corpses that could of spread to other animals who do not have the resistance. They serve to keep the environment clean and in balance. They prevent the spread of disease. There are several varieties. Each has its own unique characteristics. All walk, stand, and perch firmly and with dignity, a kind of unspoken confidence within themselves, regardless of their appearance. 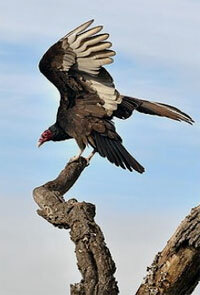 The turkey vulture has a long tail and bi-colored wings. It is the golden purifier. They will congregate on communal roosts at night and at dawn they will spread their wings to dry the dew giving an appearance of honoring the rising sun. In flight, they are magnificent. They soar with a grace and an ease that is thrilling. For those with this totem, it speaks of a coming time when you will be noticed more for what you do than for how you appear. The vulture has a wonderful ability to see and use the thermals rising from the earth, giving them lift. Their ability to use the thermals is likened to auric vision, the ability to see subtle energy emanations from the body. If vulture has come into your life, you will probably soon start to see auras around people and things. If not, vulture can help teach you. The vulture is a patient hunter. It can soar for hours without flapping its wings and as such is a symbol of flight without power. It simply uses what is available. One of the mystical secrets is its ability to levitate. Levitation is the law of spirituality. The vulture denies the materialistic. Its ability to float, rise and soar has been seen as a symbol of movement away from the mundane. It is a symbol of the disintegration of physical holds. It is a symbol of distributing one's energy so that gravity does not weigh and hold one down-—be it the actual gravity of the earth or the gravity of mundane situations and experiences. They have keen eyesight (8X humans) and a powerful sense of smell. The sense of smell is associated with higher forms of discrimination. It can help you decide whether or not something doesn't quite smell right. The sense of smell is associated with aromatherapy. This may be your most effective holistic health technique to develop or use on your self. The vulture will change foods according to its needs and internal changes. Pay attention to how you feel physically, emotionally, mentally, and spiritually after eating various foods. You will soon discover which you may need to avoid and which you may need to increase. When vulture appears, there may be changes in the elimination processes. Maintaining clear and regular bowels is important. If your energy is down or you feel yourself coming down with a cold or such, check your bowel movements for more regularity. If having trouble with heat, soak your feet in cool water, and you will find some wonderful and quick results. The vulture has no real voice, but a hiss. To some this reflects the lesson of acting rather than talking. To some it shows that vulture medicine has to do with performing rather than talking about performing. Because vulture stays on the ground for three months after birth, there is belief that it may take as much as three months before an individual begins to truly move past the death stage to rebirth. In alchemy, the vulture was a symbol of sublimation, particularly because of its resemblance to the eagle. It was considered a sign of confirmation of a new relationship between volatile aspects of life and the fixed, the psychic energies and the cosmic forces. It was a promise that the suffering of the immediate was temporary and necessary, for a higher purpose was at work, even if not understood at the time. It reflects that no matter how difficult the life conditions, rescue is as imminent in your life as was the rescue of Prometheus by Hercules. Each person is encouraged to bring whatever stones or crystals feel appropriate or necessary to support your process. In addition, several stones will be provided for use during workshop. Some of the crystals will be gifted to you. Others will be available for purchase at cost or returned at the end of the workshop. We have limited the number of attendees to 26. A deposit is required to reserve your place in the workshop. Dinner will be served on Friday night, Saturday--breakfast, lunch and dinner, Sunday--breakfast and lunch, departure at 3pm. Registration will begin at 1:00 PM on Friday, September 13th at Camp Asbury. The workshop will begin Friday running into the night, Saturday all day and into the evening, and Sunday 9:00 a.m. to 3:00 p.m. The workshop will be held at Camp Asbury, 10776 Asbury Rd., Hiram Ohio 44234. The fee for the workshop is $395 if paid by August 1st, 2013. Send $100.00 deposit to hold your space or call Lauren if you need to discuss payment. If paid after August 1, 2013, the fee is $445. This includes room and six hot meals as listed above. For further information, kindly call Lauren at 216-272-8438 or e-mail lauren@therockgirls.com to reserve a space in the circle. Please send a check, payable to The Rock Girls Inc. Mail the check to The Rock Girls Inc., PO Box 24455, Cleveland Ohio 44124. Once paid-in-full you will receive info on your stay at Camp Asbury. As part of his efforts to reclaim his Native American Indian heritage (Shawnee and Cherokee), he has been exploring indigenous healing practices. He provides workshops around the country upon request. The four chambered heart consists of being fully centered (in our heart) and actively maintaining a strong, clear, open, and full heart. The strong heart means that we have true courage that is based on our internal authority of who we are. We are able to show up and be present without preconceived notions, while having the Ability to Take Action and Enforce Boundaries. The clear heart means that we have removed our personal biases and blinders and developed a clarity about self so that we can see clearly who we are by having respect for self and for others without confusing external temptations that can lead down the destructive path of envy or entitlement. With a clear heart, we are able to assess, analyze and contain, while saying what is so when it is so, without blame or judgment. The open heart is a heart that can love itself, having been nurtured by self, family, nature, and life. It does not measure against a bucket emptied by draining one's source of life by not accepting the innate sense of being loved regardless of circumstances. With a open heart, we have the Ability to Connect and Feel, while paying attention to what has heart and meaning. The full heart means that we can embrace all of life with a sense of wisdom and generosity. It is an awareness that there are as many stories of what is life as there are people; hence, though we can influence others, we must always be open to them and their evolving story. With a full heart, we have the Ability to Initiate, Support and Create Order while being open to outcome. In the silence of who we are, we discover a part of our self that is sacred. This part of our self does not come to the surface through determination or brute force or sheer willpower. Rather it emerges from within the sacredness of who we are when sacred space is opened and safely held. When we touch our own sacredness, we touch our soul. To find this part of our selves, we need to remember who we are by traveling through the four chambers of our heart. The workshop will do several shamanic journeys over the course of the weekend. The focus of the workshop is total immersion into the spiritual world for two days so that the emergence of one's soul can surface through a memory, an insight, or a deep awareness. A large altar/vortex is created with four large rose quartz crystals and one large selenite. This creates a massive energetic field. Within this field, the people are able to find the safety necessary for the soul or inner parts of the self to come to the surface to heal and be healed. It is common for people to have transformational healing experiences. All participants who have completed the medicine wheel. Registration will begin at 1:00 PM on Friday, December 6th at Camp Asbury. The workshop will begin Friday, running into the night, Saturady all day and into the evening, and Sunday 9:00 a.m. to 3:00 p.m. The workshop will be held at Camp Asbury, 10776 Asbury Rd., Hiram Ohio 44234. The fee for the workshop is $395 if paid by November 1st, 2013. Send $100.00 deposit to hold your space or call Lauren if you need to discuss payment. If paid after November 1, 2013, the fee is $445. This includes room and six hot meals as listed above. Keenest eyes of all raptors. They are impressive and stir the imagination. 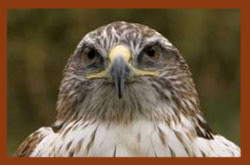 Their hunting ability, their eyesight, and their powerful flights and other behaviors are dynamic symbols. The red-tailed hawk is a messenger. Its red tail is symbolic of the kundalini, the seat of the life force. In the human, this is the base chakra. It can reflect that you will be working with the life-force or that you will work with the hawk after the kundalini is activated or that childhood visions are becoming empowered and fulfilled. The ability to soar and glide upon the currents is part of what it can teach. It teaches how to fly to great heights while keeping your feet on the ground. Hawks may be attacked by people who won't understand you or different uses of your creative energy. They may attack your ability to soar. Rising to a higher level can bring a rapid development of the psychic energies. It helps us in balancing and using these senses appropriately. It teaches the balance necessary to discover our true purpose. The red reflects a greater intensity of energy at play within your life. It reflects an intensity of physical, emotional, mental, and spiritual forces. It is a catalyst for stimulating hope and new ideas. It reflects a need to be open to the new or shows you ways that may help teach others to be open to the new. Because of the strong life-force activated by this totem, an individual with it must be careful in how they express themselves. There will unfold within you the ability to tear off the heads of any snakes in your life, or anyone or anything seen as an enemy. Your comments and actions will be like the hawk's beak and talons—strong and powerful, but with a capability to tear and/or kill. The feathering of the red-tail actually has two phases. In the summer it is lighter and darker in the winter. The lighter phase is symbolic of more joyful and sociable kinds of energy. The darker phases can reflect a time to be alone and to withdraw a little. Its phases help us to guard against blazing so brightly and intensely that we get burnt out. Through its flight it communicates with humans and the great creator spirit. It awakens our vision and inspires us to a creative life purpose. The workshop is residential and will be held at a beautiful Lutheran kids camp at Dodgeville, WI. You will receive detailed instructions with your registration. We will begin class at 9 am on each day and end at 2:00 pm on Sunday afternoon. Please send a $100 deposit or the amount in full to Marie Smith 19126 Campbell Hill Dr, Richland Center, WI 53581. If you have questions, please contact Marie Smith at marie@hawkrdg.org or (608) 647-2366 The last day for registration is October 16, 2013. Cancellations received by October 16 th will get a full refund. After October 16 th there will be a $100 processing fee. The workshop is $525 if payment is postmarked by October 16, 2013, which includes lodging for Thursday, Friday and Saturday night, 3 meals on Friday, 3 meals on Saturday, and brunch on Sunday. There is a fee of $10 for linens and towels or you can provide your own.